The quickest and most accurate way to monitor varroa levels is by the alcohol wash. After the publication of my “improved” washer design, I’ve gotten some great suggestions from readers. 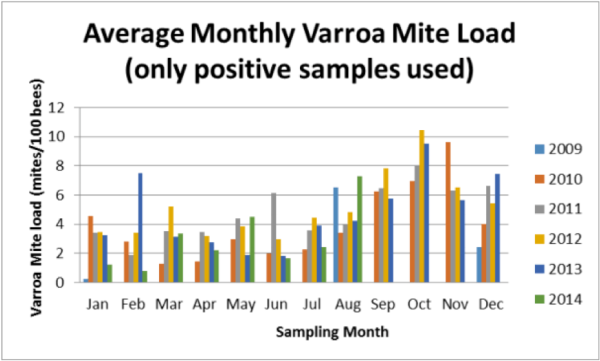 Unless you monitor for varroa, you have no idea as to what the actual infestation rate is. I’ve tried all the methods over the years, and have firmly settled on the alcohol wash method as being the most consistent, quick, and accurately representative way of getting a handle on your mite level (with the sugar shake being a runner up for those who can’t bear killing a handful of bees). A couple of years ago I published a design for an improved washer cup that overcame the problem inherent in the shaker jar—that some mites would get entangled in the bees after the final shake, leading to incomplete recovery . The new design works fantastic, but required some plastic welding, since it’s really difficult to get glue to stick . Since publication, several beekeepers have sent me ideas or samples of mite washers—thank you all! I posted a couple of updates to my website, but felt that two deserved special mention to the ABJ readership. The first is a detailed and illustrated set of instructions for building the mite washer cups, put together by Idaho beekeeper and tinkerer Larry Clamp, and posted to my website . The second is a simple, but brilliant idea by Mike Banyai, a second year beekeeper in Michigan. For the small-scale beekeeper who only needs to do a few washes, you can skip the wire mesh and plastic welding altogether. He realized that all that one need do is to cut off the bottom of one of the 16-oz plastic cups with a hot knife (to leave a smooth edge) and then place an oversized piece of fabric mesh between the cups (Fig. 1). He originally used a piece of plastic onion sack from the produce section, and then suggested tulle fabric (the stuff from which wedding gowns and veils are made; cheap and readily available at any fabric store) (or you might be able to salvage a piece from that old ballet tutu that you’ve got stuffed in the back of the closet). Figure 1. 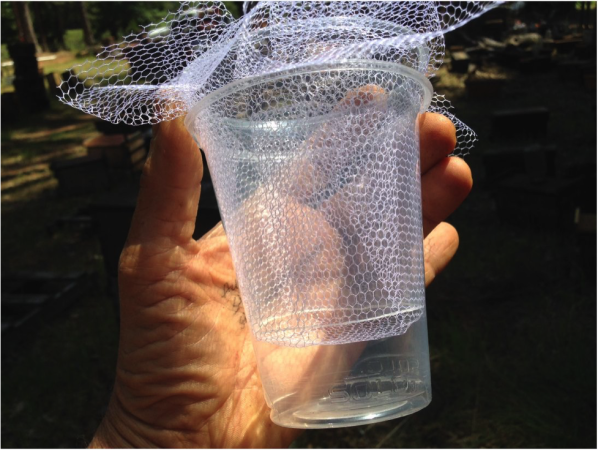 Here are two nested plastic cups (type not important), with the bottom of the inner cup cut off, and a square of tulle fabric sandwiched between them. Figure 2. The mite washer in action. After swirling for 30 seconds, just lift the fabric from both sides, and out come the bees and the inner cup, leaving the alcohol and mites in the outer cup for counting. Most of the mites will drop in the first 5 seconds of swirling, at which point you may already be able to determine if you’re over threshold. 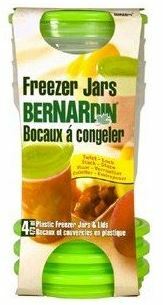 Mike Randell from British Columbia, suggests using a heavier-duty off-the-shelf cup: Bernardin (brand in US is Ball) plastic freezer jars. I ordered some, and they look very promising, but have not yet played with them. We carry two nested Rubbermaid dishwashing tubs (the curve of that brand matches that of the measuring cup); a dirty one nested inside a clean one (Fig. 3). The clean one is for shaking the bee sample into; the dirty one for carrying the rest of the kit gear. We carry at least three mite wash cups with lids (so that we can be counting one while we’re taking a second bee sample, and for a spare in case one breaks), a ½ cup stainless steel measuring cup, a tea strainer for filtering the alcohol for reuse, a funnel for pouring it back into the bottle, and of course a bottle of rubbing alcohol (when we don’t have tequila on hand). Figure 3. Our mite washing kit. 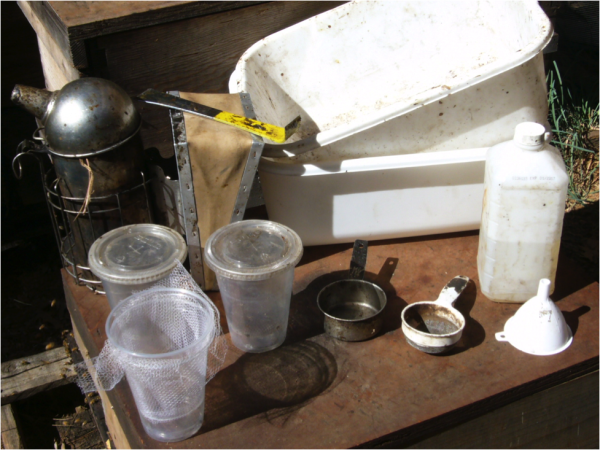 We carry everything but the smoker in the upper tub, and use the clean lower tub for taking the bee samples. I set out both types of washer cup designs for the photo. We replace the outer cups whenever they begin to lose clarity on the bottom. How Many Mites Is OK? I hesitate to give hard and fast rules. The mite infestation rate, as measured by an alcohol wash of ½ level cup of bees from the broodnest (roughly 310 bees), will be at its lowest point in early spring, and rise slowly as the colony builds until it reaches peak population. Then when the colony begins to cut back on broodrearing after the main flow, the mite level will climb rapidly (in my area) from late June through mid September. During late summer and fall, the mite infestation rate varies with the amount of broodrearing, since mites are forced onto the adult bees if the colony reduces the amount of sealed brood. 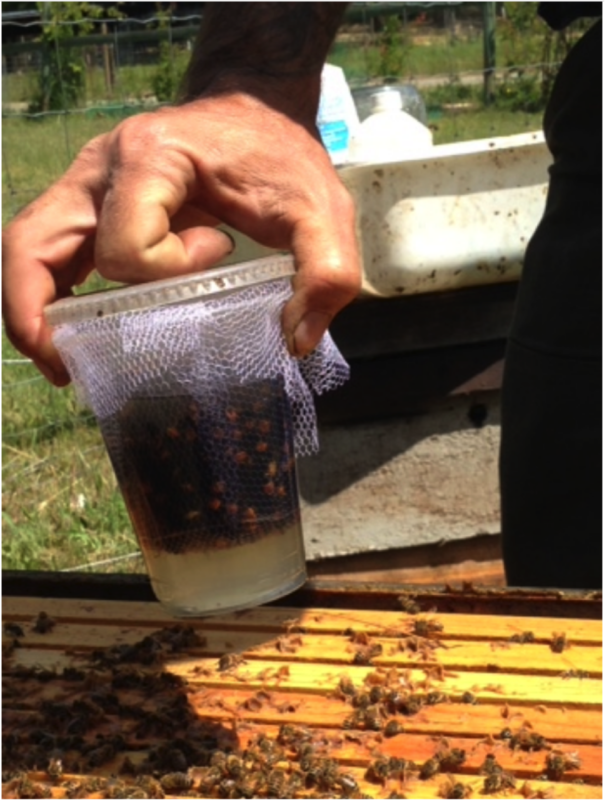 Practical application: the alcohol wash measures the infestation rate of mites on the adult bees (as opposed to the total number of mites in the hive). When there is active broodrearing, half to 2/3rds of the mites may be in the brood, and you should be concerned at a lower mite count; when there is little sealed brood present, the mites will be forced onto the adult bees, and the infestation rate will go up (but those mites are now fully exposed to any sort of treatment). Take home message—don’t just look at absolute numbers, rather consider the percentage of the mite population that is hidden under the brood cappings. And take that into consideration when applying treatments. And don’t forget that there can be serious mite immigration from collapsing colonies within flight distance, in which case mite levels in late summer/early fall can spike suddenly. Practical application: many beekeepers get blindsided when a wave of mite immigration hits their hives in fall. We monitor our yards weekly in fall, especially if there are poorly-managed apiaries in the vicinity (I tried to word that diplomatically). We try to keep mite levels down to the 1 mite per wash level in early spring, allowing the level to rise to maybe 4-5 by late June (on average; of course, some colonies will have higher or lower levels). Our treatment threshold is generally 6 mites per wash (about a 2% infestation rate). We may allow that rate to climb a small amount at its peak in mid September, but then really work to get it down to below 6 until November, at which time we knock it down to next to nothing with an oxalic dribble. At about 15 mites per wash, we start to see virus issues in the bees and brood (although we see huge colony-to-colony differences in their resistance to viruses). At 45 mites per wash, colonies generally start to crash. Practical application: it’s far easier (and much better for your bees) to be proactive rather than reactive. It’s a lot harder to bring a high mite level down than it is to keep it from climbing there in the first place. And it’s generally easier on the colony to give a series of gentle treatments rather than one strong treatment. Remember, you can take your bee samples from honey frames (far less intrusive than disturbing the broodnest, and much less chance of accidentally killing the queen). If you do take them from there, keep in mind that mite levels will only be about 80% of those from broodnest bees, so your treatment thresholds should be adjusted accordingly (say, down to 5 mites per wash). The Canadian Association of Professional Apiculturalists (CAPA) recently released their survey for 2014 winter losses (based upon data representing 50.8% of all colonies operated and wintered in Canada in 2014) . The national average percentage of colony winter loss was 16.4%. Overall, the reported national colony loss is one of the lowest losses since 2006/07 and represents a decrease of 34.4% from 2013/14 winter losses. Compare the Canadian 2014 winter loss of 16% to that of beekeepers in the U.S. of 23% ( note that several of Canada’s beekeeping regions experienced below average temperatures , although parts of Eastern U.S. also experienced an unusually cold winter . What could be the cause for U.S. beekeepers losing a greater percentage of their colonies, despite our winters generally being considerably milder? Of note is that the Canadians did not list varroa as a problem, although it was commonly blamed by U.S. beekeepers (especially the more knowledgeable commercial guys) . As you can see, U.S. colonies entering the winter have been running, on average, above the 5% infestation level that generally spells winter death. But surprisingly, many U.S. beekeepers never or rarely monitor effectively or consistently for varroa levels. In 2014, over 73% of surveyed of beekeepers monitored Varroa mite infestations mainly using the alcohol wash or the sticky board methods. Alcohol wash was the most preferred technique in all provinces, except Quebec and British Columbia…These results demonstrate that beekeepers recognize the value of surveillance and monitoring of Varroa mites. The educational programs delivered to beekeepers in Canada have made a difference in the application of proper beekeeping management practices for Varroa mites. My beekeeper friend Brion Dunbar says that he’s had good luck with 3M ScotchWeld High Performance Industrial Plastic Adhesive 4693H. Steinhauer, N, et al (2014) A national survey of managed honey bee 2012-2013 annual colony losses in the USA: results from the Bee Informed Partnership. Journal of Apicultural Research 53(1): 1-18.